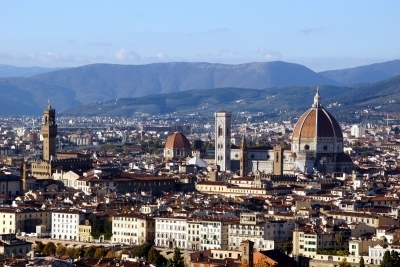 The Historic Centre of Florence is the birthplace of Renaissance art and architecture. It became world leading in the arts and trade from the 14th to the 17th century. Florence is said to hold the “greatest concentration of universally renowned works of art in the world”. The principles developed here exerted their influence to all over Europe. It formed artists such as Michelangelo and Leonardo da Vinci. Guided by the banking family De Medici palazzi were built, the Uffizi artmuseum was founded and Brunelleschi finished the gigantic Duomo. In 2011 I started taking courses towards a Bachelor degree in General Cultural Sciences at the Open University. This involves a mixture of Literature, Philosophy, Cultural History and Art History. It’s now almost four years later and I have nearly reached my goal: only my bachelor thesis is left to do. Part of the programme was that I “had to” attend an in-depth, 8 day study trip to Florence. A great excuse for a proper revisit of this rich WHS! We were 20 mature students, and each of us had to deliver a 30 minute lecture about (and in front of) a Renaissance art or architecture object in Florence. We had been preparing this through literature study beforehand. Florence seemed to be in good shape when we visited in April 2015, nothing like the decay you hear about regarding Rome or elsewhere in Italy. A few sights are being restored at the moment, such as the Baptisterium. But there’s plenty left: even a packed 8-day schedule will not cover all worthwhile sights. 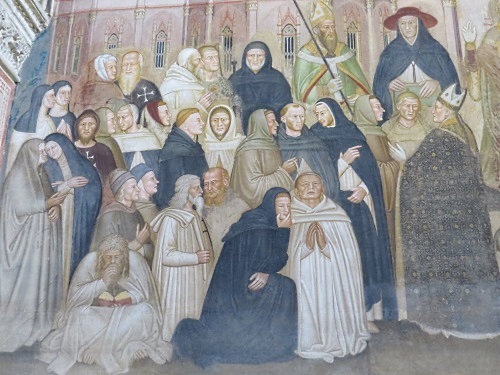 We did spent much time at individual works of art: we stood staring for 45 minutes at Massacio’s Holy Trinity in the Santa Maria Novella for example, a fresco that might only get a glimpse of the more casual visitor. “My” subject involved the Spanish Chapel inside the Santa Maria Novella monastery. You have to know where to find it, the monastery is adjacent to the church with the famous marble Alberti facade. One of the doors in the cloister leads to this fresco scheme, consisting of 8 paintings. They were done in 2 years time (1365-1367) by Andrea de Bonaiuto. They especially celebrate the role of the Dominican Order. It has great detail and is in good condition. We had an almost surreal experience while visiting the Palazzo Vecchio. The main feature of this Town Hall, the enormous Salone dei Cinquecento, was taken over by the “Condé Naste Luxury Conference”. Humble tourists or students like us weren’t allowed in (a UK princess was of course) – we could only look down on it from the balcony and were scrutinized all the time by two bodyguard-types. While they were talking on a podium about "hard luxury", we tried to imagine how the hall would look like without them. 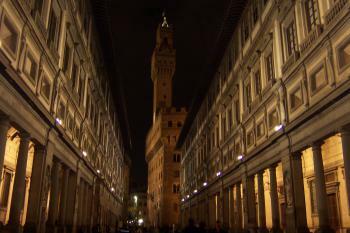 I had visited Florence before in 2002, and was appalled at the time by its crowdedness. I wasn’t annoyed so much by it this time. Of course it’s busy in the streets, and surely getting into the Dome or the Uffizi can be a pain. But it is much less so in the other “paying” attractions or the churches. And those churches and chapels are the treasuries of most of the art anyway. 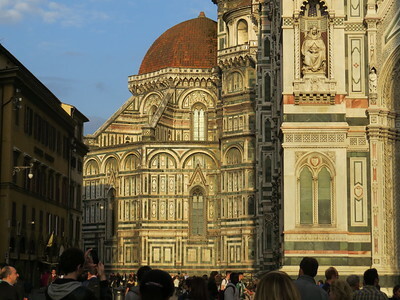 I’ve added a number of links in the “Florence Links” section for ideas about where to go and when to visit. Artwise there's nothing in the world like Florence, where you can see so much great art in situ in such a compact area. Still worth going in my opinion! I visited Florence several times, both as a tourist and for buisiness reasons, most recently for four days in November 2017. And that is also the best time for a visit in my opinion: still pleasant weather with good chance for sunshine and less tourists, at least in comparison to the high season (from Easter to All Saints' Day). However, there are still long queues at the most popular sights. For the Cupola of the Duomo, I would suggest to pre-book tickets and a time slot, there is only a limited amount of day tickets available. Pre-booking is also recommended for the Uffizi, unless you just want to see the highlights, then a late afternoon visit is the best choice. If your time is limited and you want to visit as much as possible, the FirenceCard might be an option, it includes priority access to all museums and sights (with the exception of the Cupola). But it is quite expensive: 72 euros for 72 hours. So rather suitable to skip the queues, not to save money. One of the best things to do in Florence is to stroll through the city, looking for the remote corners (yes, there are some), enjoying the atmosphere and taking a break for a coffee or a gelato. Having said that, I must also admit that a bit of planning is helpful. At least, you should check the current opening hours and closed days, they differ between the various sites. As an example: the four parts of the San Lorenzo Complex (Medici Chapel, Basilica, Cloister, Biblioteca) have different opening hours, three entrances and two ticket desks. Florence made a much better impression on me on my second visit, in May 2013, than when I first visited ten years before. Perhaps it was because I had not been traveling for as long before my second visit, or perhaps it was because I was older; either way, I found the city much more enchanting the second time around. Florence is a great Renaissance city, full of memorable art at the Uffizi Gallery and the Accademia, including Michelangelo's masterful David. Florence's Duomo cathedral (aka Santa Maria del Fiore) is visible from outside the city, and is just as amazing up close as from far away. The inside of the cathedral is beautiful, but I'll need to go to Florence a third time so I can finally take a tour to the top of the dome. Not far away, Florence's picturesque Ponte Vecchio crosses the Arno River, which runs through the city; I found it fascinating to imagine what the shops on the bridge must have been like in medieval times. On the south side of the Arno is the Piazzale Michelangelo, which I highly recommend for a fantastic view of the center of Florence. Logistics: Florence can be reached by car, bus, or train, but the central section of town is best appreciated on foot. I visited this classic WHS for the first time recently, in November 2015. This was low-season, tourist-wise, but the city was doing a brisk trade in sightseeing nonetheless. We managed to get into the Accademia with only a 15 minute wait, and the Uffizi we were able to walk straight into! I can recommend the Palazzo Medici Riccardi for its Magi Chapel and Giordano ceiling. For a cityscape there is an excellent viewpoint to the southeast of the city walls, atop a hill. Also worth seeing is the Basilica of Santa Maria Novella, where there hangs an early Crucifix by Giotto (although unfortunately Masaccio's Holy Trinity - one of the first works to demonstrate a knowledge of the laws of perspective - is currently out for restoration). On the agenda for next time are Brunelleschi’s Pazzi Chapel (the ‘first’ Renaissance building) the Bargello museum and the Palatine Gallery, as well as the half of the Pitti Palace that we didn't manage to fit in. A fantastic scupture museum that is not crowded is the Bargello, full of marvelous statues by Donatello, Michelangelo, della Robbia and Giambologna. It's courtryard is lovelh, too. Another museum with few visitors is the Archeology Museum, which has gripping bronze chimera done by Etruscans, as well as many Etruscan tomb statues with realistic faces, including big noses and funny facial expressions. 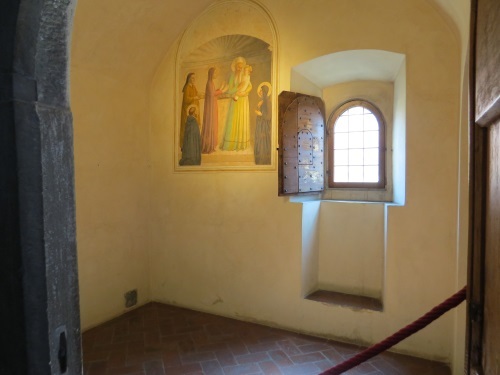 The Palazzo Davenzait is a medieval palazzo that is fittingly furnished with few visitors. I had not realized how much I like Ghirlandoa's frescoes until seeing them at Santa Maria Nouvella and Santa Trinita churches, neither of which was crowded. I share the preference for Florentine steak from the Mercato Centrale. I have visited Florence for the third time now and I always find something new to visit or explore. This time I was lucky enough to get a private group tour of the Corridoio Vasariano connecting the Uffizi to Palazzo Pitti through Ponte Vecchio. Neverending portraits and magnificent views of the Arno from the corridor's windows. A must see if you're lucky enough to be able visit! I visited this WHS in September 2006. It is surely one of Italy's best WHS and it is the symbol of Renaissance. The Brunelleschi Cupola and the Battistero were the highlights of my visit coupled with a generous bistecca fiorentina and some Chianti wine! the Renaisance architecture. I enjoyed the Ponte Vecchio. Firenze has a much more laid back feel than Rome. Florence was a lovely place to spend two days. 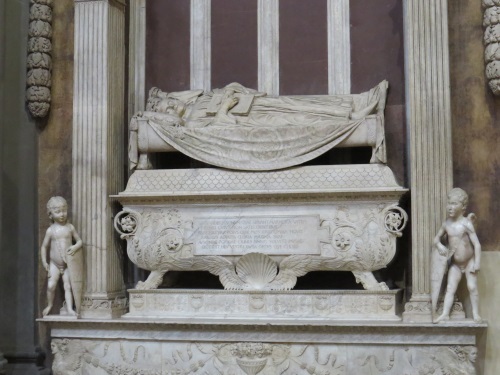 I really enjoyed just wandering around between the huge, if austere (showing that Florence’s developmental roots in medieval Europe), palazzo and stumbling upon some particularly fine churches. The cathedral has a hugely impressive façade and of course Brunelleschi’s dome is one of the great architectural achievements of the renaissance. The interior was a little underwhelming though after the exterior. The dome was undergoing renovations whilst I visited, and it seems that the exterior had been cleaned on three sides, but the rear was a little grubby. I also visited the Academia gallery, worth it for the Michelangelo sculptures including David and his unfinished works intended for the tomb of Pope Julius II, but the other exhibits were a little disappointing as I have no great interest in iconography and early religious art. Palazzo Vecchio (pictured) was a lot more interesting than I thought it would be and worth a visit if you want to avoid the queues elsewhere. The Medici chapel was impressive and culturally important, the full price entrance fee was a little steep though. I would also recommend the hike up to Piazzale Michelangelo for the best views of the centre. I also really enjoyed the train station, which is a fine piece of fascist modernist architecture and sold excellent coffee, I know this wont appeal to everyone though! I can understand how some people may be annoyed by the vast swathes of tourists, I visited in November and the queue for the Uffizi gallery was still about 1h 30m, but I just had fun wandering off down back lanes and finding cheaper ice cream shops. Florence is a fine European city with a cultural wealth that only a few world cities can match, just be prepared to spend your time there with a lot of other people. Florence is simply a great city and a must for any vistor to Italy. Unlike many other places in this country, the city doesn´t offer any sights from Antiquity (ancient Rome), but this is more than made up by the numerous monuments (palaces, churches, parks, bridges, the Cathedral) from the Middle Ages and the Renaissance period, the time of Florence´s greatest cultural flowering. The whole city is a work of art - the cradle of the Renaissance -, and names like the Medici, Boccaccio, Petrarca, Dante, Galileo, Giotto, Botticelli, and Machiavelli are famous everywhere (have I already mentioned da Vinci and Michelangelo? 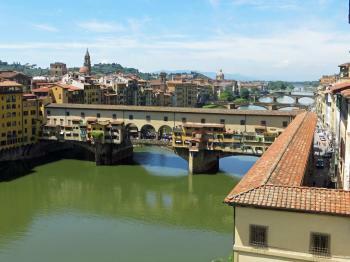 ), and Florence is one of the cultural hotspots (not only of Europe but of the world) that everybody should have seen. Florence can be overwhelming. I had the good fortune of living there during the summer of 2000 which enabled me to see the city at a far more leisurely pace than the average tourist. Highlights for me include: relaxing at the Piazzale Michelangelo while taking in the best view of Florence; on the Oltrarno, the Brancacci Chapel with frescoes by Massaccio, a significant artistic contribution that is often overlooked by the casual visitor; sitting at a cafe in Fiesole, enjoying the slower pace of Florence's hilltop neighbour; and, closer in, the Convent of San Marco, where Fr'Angelico decorated the monastic cells with incredible frescoes. Certainly, the tourist with only a few days to spare will want to stay in the centre to take in as many 'must-see' sights as possible, but if you have the time, take some side-trips to the lesser known places to escape the crowds and the trappings of kitsch. Excellent news: Florence has decided to ban 'gipponi' (large jeeps) from the city centre ! I hope more historic cities, including my own, Athens, follow suit. I have been to Florence last Nov 2002. One thing I must praise was that Italian done a very good job in maintaining their heritages! More than 100 years’ buildings, statues, paintings & frescoes still preserving very well!! The Duomo and Santa Maria del Fiore definitely looks superb! What was impressed me is not the building itself, but was the bronze door of the baptistery (cast by Lorenzo Ghiberti in the early part of the 15th century)! It looks amazing!! Now I understand why Michelangelo descript it as the gates to paradise!! Also, don’t miss the Uffizi Gallery. Lots of extraordinary masterpieces can be found here! And, of course, must try the decision gelato!! Florence has its own small airport. The historic center is small enough to explore on foot. Architectural design competitions: Brunelleschi won the competition to design the cathedral in 1418. Italian fascist architecture: Sta Maria Novella station. constructed 1932-4 " The plan of the building, as seen from above, looks as if it were based on the "fascio littorio" the symbol of Benito Mussolini's National Fascist Party, many documents give this explanation, but, that shape was forced by the pre-existing station. The "blade" represented by the first two passenger tracks and the postal ones were in fact the extension of the 1861 alignment which included the tracks of the line from Livorno." (Wiki). This interpretation is elsewhere disputed. Equestrian Statues: Ferdinando I de' Medici,by Giambologna and completed by Tacca (1608). On the Piazza della Santissima Annunziata. Made with bronze from captured Turkish galleys. Cosimo I de Medici by Giambologna (1594) on Piazza della Signoria. Historical Financial Institutions: The HQ of the Medici Bank 1397-1494. A very significant Bank in European and world financial history. At the Via dell'Arte della Lana were the "bancos" or benches where Florentine bankers carried out their trade and from which the very word "Bank" came. Invention of sweets: The invention of ?Gelato?, the confection based on ice, cream and egg yolk as a development of the older water-based sherbet/sorbetto has been linked to Florence during the rule of Catherine de Medici. One version is that the architect and all-round Renaissance man Bernado Buontalenti was charged by Catherine with preparing 'events' for diplomatic guests including banquets and entertainments. In 1565 one of these served a frozen dessert with a recipe approximating to modern 'Gelato'. Buontalenti Gelato is still available! Geoffrey Chaucer: Visited in 1373 on "secret business" for Edward III - thought to be negotiations for loans with Florentine bankers. It is not known if he met e.g Boccaccio or Petrarch but the visit is credited with introducing him to stylistic and subject aspects later incorporated into the Canterbury Tales which exhibit considerable parallels with the Decameron. Built in the 15th century: Renaissance principles by Brunelleschi (completed the cathedral's dome in 1436) e.a. 686 Community Members have visited.